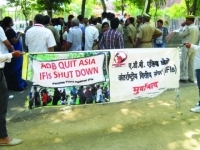 In this edition of Focus on the Global South Newsletter, we revisit the Asian Development Bank’s role in the ‘privatization’ of Asia and how the World Trade Organization’s free trade and investment policies have jeopardized people’s rights and the environment. Through its growth strategy, ADB continues to promote privatization and create an economic environment that expands private sector role in investment, agriculture, infrastructure, etc. at the expense of “workers, urban and rural poor, and agricultural, coastal and indigenous communities.” The intensified thrust towards commercialization of agriculture is dispossessing farmers in Cambodia, India, Bangladesh and other parts of Asia. 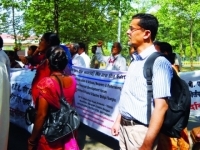 In India recently, the ADB held its 46th AGM, where government welcomed India’s increasing loan portfolio with the Bank, even as people’s and community organizations, trade unions and academics mounted resistance outside the New Delhi venue of the meeting. In the lead up to the December 2013 9th Ministerial Conference of the WTO, Focus finds it essential to look back at the highlights of the struggles of social movements in Asia and other parts of the world against the WTO: from the suicide of South Korean farmer Lee Kyug Hae to the historic siege by 20,000 Thais of Sheraton Hotel in Chiangmai during the 6th round of US-Thailand FTA negotiations to the overwhelming support in the Philippines of the campaign against the Doha Round, which led to the creation of the Stop the New Round Coalition, to the series of mobilizations launched by the Indian People’s Campaign Against the WTO to the “Battle of Hong Kong” and the protest actions that La Via Campesina led in Geneva in 2006. Amidst the unabated assault of free trade and privatization, social movements for land struggle are “pushing back the issue of agrarian reform to the center of both national and international policy debates and development agendas.” One way that this is being done is by enlarging the platforms for the discussion and promotion of alternative models that challenge the “agro-export model.” The article “The Struggle for Land in the 21st Century” critiques this model and underscores the current struggles to defend right to land, food and water, and to give space to alternative models being pushed by rural communities and social movements. In the name of poverty reduction and inclusive development, the ADB continues to promote the transfer of natural wealth and public assets to private companies across the Asia and Pacific region. Through loans, co-financing and Technical Assistance (TA), the ADB creates and demands conditions for widespread privatization in virtually every sector, from transportation, energy and urban development to agriculture, water and finance. Access to and control of land was the motivating force for many of the world’s revolutions and uprisings in the past century. Fast forward to this century, there is renewed interest and commitment among social movements, local and national civil society organizations (CSOs) and progressive academics to push the issue of agrarian reform back to the center of both national and international policy debates and development agendas. A critical issue for many land rights activists and rural social movements are women’s access to and control of land. Women have their own struggles within the struggle for land access and control: fighting both the patriarchal state and its agencies and against patriarchy within their own organizations. Several milestones in the campaign against the World Trade Organization and free trade agreements will be marked this year as the struggle continues. Many of these key moments in the struggle involve major mobilizations in Asia spearheaded by peasant and fishers organizations working closely with other social movements to resist the onslaught of free trade and investment policies on agriculture, on jobs, on the environment and people’s rights.